A description of Tantalus inevitably requires us to employ superlatives: best launch, worst landing options, most urban setting, fewest flyable days. Then there's switchiest air, boatiest lift, and scariest sink. But how about earliest flight, least qualified student, most embarassing incident? Or even, heaven forbid, longest article? Peter B. helped me lay out and launch to join Pete in the nice boaty air over the overlook pavilion. Lots of big easy figure eights until suddenly all the lift was gone and headed into trees on Diamond Head side, came down draped over a thirty foot Koa. Took over an hour to untangle and tug it out. Waved at rescue copter. Clammed up for reporters. Sighed with relief when Pete smooth-talked the cops in cruisers. That's the fourteenth entry in my logbook, from December 19, 1999. Not the fourteenth flight since my P2 sign-off - fourteenth flight EVER, after mostly bunny hill flights. For those unfamiliar with Tantalus: I'll start with the positive points. It's a drive-up site. A verdant state park on the Round Top ridge (adjoining Tantalus), a thousand feet above sea level on the shoulder of Manoa Valley, with a breathtaking view of Honolulu from Diamond Head to Ewa. 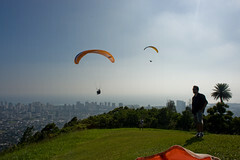 The vista invites comparisons to the views below the spectacular urban flying sites of Rio, Monaco, or Hong Kong. Surrounding the lookout pavilion is a huge grassy clifftop lawn to rival the best alpine launch slopes of Europe. From here you can catch thermal cycles to cloudbase while taking in a fabulous view of the Honolulu cityscape. And you can even topland right back at launch! What more could you ask for? Well, how about a landing zone, or even a good bomb-out option? And now for the not-so-positive points. By far the best landing option here is back on top at the launch (which seems a lot smaller when you're landing than when you're taking off). But what if you don't actually get up from launch? A few hundred feet down the cliff is the so-called bomb-out LZ: a slightly widened area of the road where a couple of cars can pull off to admire the view on the way up. Only a lunatic would consider that little patch of roadside asphalt a landing zone. Quite a few more hundred feet below that sprawls the densest collection of tall buildings, power lines, and residential neighborhoods that you will ever fly over, interspersed with school playing fields and city parks, all of which have generated unwanted interest from security and enforcement personnel over the years when our pilots have dropped into them. Tantalus is very rarely flyable, at most a handful of days a year, when the winds are light and southerly and it's not too cloudy. The air here is famous for sudden switches in direction, most notably from straight up to straight down. In addition, there is a busy airport approach corridor right in front of the ridge. Venturing away from the ridge at all puts you over the grandfather of all Part 103 "congested areas". On that fateful day a little over eight years ago, we had been waiting in vain all day at Diamond Head for the sea breeze to get strong enough to allow us to try soaring there. For future reference: a sea breeze is never soarable at Diamond Head. Late in the afternoon Reaper finally surrendered to the sea breeze, and decided instead to lead a charge up Round Top Drive to check out Tantalus. I hustled up there and watched the guys file into the air, but some modicum of sense led me to question the wisdom of following them. I couldn't see the school field the guys described to me, somewhere down below and around the corner. In retrospect, only a lunatic would consider launching here with only fourteen flights to his name. Reaper's visiting comp pilot buddy Peter Brinkeby was there, but without a wing, and he said to me, if you aren't going to fly that thing then give it to me. I sure wish I had. For future reference: if Pete B. offers to fly your wing, let him. You can tell your kids you once loaned a wing to one of the world's top pilots. Instead, I asked him if he thought I should go for it. What did he know? My instructor was already in the air. I radiod to ask him too - he said sure, whatever. For future reference: Reaper is not the type of guy to tell you that you're not ready to try something. Seeing several gliders soaring easily above the ridge, I couldn't resist the temptation, and Peter B. helped me launch. I got up easily in smooth boaty lift and did big slow figure eights right over the park, between the lookout and the antenna station. After a half hour or so, the lift died all at once, and everyone started to sink out and headed around the corner out of sight. I tried to follow, but my beginner turns were too slow for that sinking air and I plowed into the forest canopy just below the park road, halfway between the lookout and the antenna station. My big red wing was perfectly snared at the treetops for all of Honolulu to see, and I had to endure the unwanted attention of a rescue helicopter, two police cruisers and a news team. Peter Brinkeby turned out to be a fabulous tree climber and helped me get my wing down - it still took us at least an hour. Now I can tell my kids how one of the world's top pilots scrambled up a tree to rescue me from severe humilitation after a major lapse in judgment. What's more, Reaper turned out to be a top-notch hostage negotiator, and the cops let us all out of there with a warning. After that embarassing incident, I soon figured out that Tantalus wasn't a regular flying site for students or novices. In fact, the only people that seemed to fly there on the few days it worked were the hottest of dogs, the boldest of cowboys; notably Nalu, and later on, Fireman Dave. Guys who were willing to take their chances with the man, and with mercurial flying conditions. I heard horror stories of pilots getting ticketed on launch by irate DLNR officers, and even one storied weekend in jail for a city flyover. I heard about security guards hassling pilots who landed at private school playing fields and golf courses and city parks. One of our more notorious hot dogs once sunk out onto a rooftop below the lookout. Another time a pilot pulled off a miraculous spot landing in the tiny triangle park at the foot of the hill, bundling his wing into the bushes just in time to see police cruisers speeding all around trying to find the fiendish parachutist. Seven years went by, and we heard fewer stories of persecution from the few pilots that flew there. At one point there was even a newspaper column that described our flying there as "rare but allowed". I drove up there numerous times with other folks, but even on the occasional days when the weather supported it, I didn't launch. The recent closure of Round Top Drive forced us to drive almost an hour around Tantalus Drive, and that made checking the conditions up there quite a bit less appealing. But this past year I finally flew Tantalus again, with Suicide Pete. It was his first flight there, and my first since the ignominious tree crash. We drove the long way around, and spent a while checking it out, before Pete bravely decided to take the plunge. The air was going up like gangbusters, with some kind of massive convergence, and Pete was quickly sucked up to cloudbase high overhead. I gritted my teeth and forced myself to join him, but I instantly regretted it, finding that the strong lift wasn't helping me get over my long-simmering anxieties about this place. After frantically trying to spiral down through the rising airmass for what seemed like eternity, I gradually managed to fight my way below ridge height, and then made numerous attempts at toplanding, before finally tumbling onto the hilltop in relief. This was certainly not the therapy session I had been hoping for. I drove down to pick up Pete at Manoa District Park, wondering if maybe this just wasn't a site I'd ever come to terms with. But this past Friday, I achieved a breakthrough in my treatment - I flew Tantalus a third time. I actually flew twice, toplanding and re-launching for the second one. I can only describe the flying with the most hackneyed term in paragliding: epic. To my great relief, I found that the flights were not only safely executed and free of persecution or encounters with foliage, they were supremely enjoyable. I drove up the short way, since the road has been reopened, and met Pete out there again (see his florid and sesquipedalian account here), along with Jaro and Berndt, and Bob who just came to watch. The four of us enjoyed surprisingly smooth thermic conditions, exploring Round Top ridge, Manoa Valley and the vast sky above them until we just couldn't handle any more of that sweet air. We all pulled off interesting but effective toplandings below the pavilion, and as we packed up our gliders on the lawn, in the long shadows of the date palms, we felt like the luckiest people on earth. Needless to say, Tantalus is not an appropriate flying site for a pilot with only fourteen flights. In many ways it is our most demanding and risky site. Demanding of our skills and judgment, and risky for our safety and our criminal record. I guess that's why the hot dogs like it so much. The majority of pilots will never even consider flying here, but for those who aspire to it, I urge you to take your time, try all the other sites first, and work on your thermalling and your top-landing skills elsewhere before finally launching Tantalus. I can tell you, it's worth the wait. Wow, that is a great article, did you say " mercurial", wow again. Tantalus has many differemt moods, from overcast ridge soaring with a beginner like Conrad Nakamoto; to the oops it feels like I just launched into the leeside thermic grinder kind of fun. The bombout on the road looks mean, but hasn't bit anyone yet that I know of. I have seen Doyle, Gerdes and ,Steph and Jimmy tandem scratch from beneath the road and get back up. I have flown to Kapiolani Park from there, thermalling Waikiki, without incident. I have seen Reaper launch into a leeside cycle, disappear for twenty minutes, and then climb high above launch and topland like Lazarus. Toplanding seems to be the biggest problem, and I have seen pilots including myself, strewn about the bushes near the launch area. Our only hope is that we learn a little more each time. Sure you get higher at Nanakuli, go further from Makapuu and are more relaxed at Kahana. But when you get the taste for something a little spicier, it can't be beat. sesquipidalian!! I resemble that remark! I am impressed that you were able to pull that word out of your vocabulary list . . .
One correction: Before our first flight there together, I'd been to Tantalus on a few occasions, (Even helped pull a certain Hotdog's wing out of a tree), I'd just never had a successful flight. The next day, Brian & went back. I launched first and bombed-out to the road. I have to say, I would rather not have to land on the road agian. dudes, how come i haven't flown this place yet ?? sounds and looks awesome !! My 15th flight was my first cross country trip, following Reaper from Kahana to PCC, missing our intended soccer field LZ and getting blown back into the farmland deep behind Laie. And my 16th flight? Tandem with Reaper from Makapuu to Kahaluu, setting what must have been the Oahu tandem distance record along with two other tandems flown by Jimmy (Stefanie was his passenger) and Nalu. I guess I could have stopped after 16 flights and still called it an epic flying career. Or maybe those early flights were just the perfect fuel for my subsequent long years of obsession with flying.